My cat always sits in the kitchen staring while my family is eating dinner. I decided it was time to find her something that she could eat while we are eating dinner that will satisfy her. 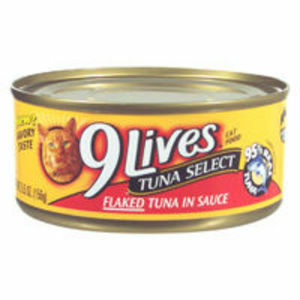 I chose 9 Lives Tuna Select Canned cat food because of the flavor. Of course I hve always heard cats like seafood flavors, so I thought she might like this one because it is tuna. When I first opened the can, it definitely had a strong fishy smell. My cat was drawn to it pretty quickly. She ate the food until it was gone. After she finished I did not notice any strange behavior from her, so I assume the food worked well for her stomach and did not upset it. This food is an affordable food that my cat really enjoyed. I only give it to her every now and then though so it can seem like a treat to her. I rated this cat food an eight out of ten only because of the smell of the food. It is pretty strong and if my cat does not eat it quick I can start to smell it throughout the house. It could just be me personally because I do not like seafood, so the smell is probably really distinct to me. My poor first pet, a sweet cat named snowball, had to put up with all my ignorance about quality ingredients and had to suffer through nutrition-less meals her whole life. Well, she did not see it as suffering, she absolutely loved all the junk I threw her way! 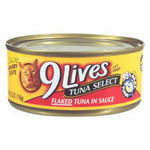 9 Lives Tuna Select is a good option to feed your feline if you are only feeding it to him or her occasionally! Moderation is key here. 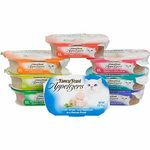 The ingredients are a bit better than some of the canned foods out there, but it doesn't provide enough nutrition to be a staple of your kitty's diet. If you want to give them a real treat, let them have a can of fresh tuna! Quality of Ingredients The meat content of this canned food is surprisingly low, given that it is touted as a "Tuna Select" meal. It has corn and corn meal listed as top ingredients which should always clue you in that it isn't the highest in nutritional value, rather it is bulked up with fillers. Flavor Selection Lots of flavors! I wouldn't say completely avoid this brand, but just be sure to read the ingredients. Some of the flavors tend to be more nutrient dense than others. Always do your research and you will have a healthy pet! I picked some of this up and my little guy really seemed to like it. It does stink a little, but it is tuna so that is to be expected. It is flakes of tuna, not large chucks or a pate. It is also in this thick gravy type of sauce. The tuna seems to be very tender, it comes apart easily when I fork it into his food dish. It is soft enough for a kitten to eat, yet meaty enough for a full grown cat. Quality seems to be good and it is priced very well so I will continue to buy when I see it in my local store. Quality of Ingredients I obviously do not eat this, but seeing how my cat devours it I would have to assume the ingredients are very high quality. The tuna flakes very easily making me think it is fresh and the gravy it is in is nice and thick. It does have a bit of a strong smell when you first open it, but I have yet to find a wet cat food that does not smell strongly of the main ingredient. Flavor Selection This food really looks and smells like tuna, you can tell 9 Lives cares about the product it's putting out. I purchased 9 Lives Tuna Select Canned Cat Food last year and was not at all happy with the result. I fed my cat with the food and within an hour, my cat puked out the entire food and started feeling restless after eating the food. It was later when I checked the reason for my cat falling sick and it was the taste of the fish in the product which was a not fresh. My cat eats very less food and mostly only once a day and this product was advertised online after which I bought the same but it failed in terms of the quality of the food. The product contains very less fat which is generally required by cats and also contains wheat as an ingredient which is not normally good for cats and my cat has a sensitive tummy due to which it reacted on her. The product is priced good but the product gets delivered very late when one orders the product online or from a grocery store as the product is usually out of stock. I have a Persian cat and she is a pretty picky eater. I usually give her dry food because it doesn't break the bank, but every once in a awhile or once a week I like to give her canned food. So 9 Lives Tuna Select Canned Cat Food is a good option for her. She loves tuna and this is perfect for her. She is not a huge eater so these cans will last for feeding her two or three different times. She loves the flavor and eats up every bit. As soon as she hears me opening the can she comes running because she knows she is getting a treat. It is a pretty good price, but not for everyday use, I don't think. This has never bothered her or made her sick so I will continue to purchase it for her. Quality of Ingredients I think the ingredients are pretty goo as far as canned food goes and my kitty likes it so that is the most important to me. Flavor Selection She loves the tuna flavor of this brand and I like giving it to her for treats as well. OK, this isn't the most expensive or best canned cat food on the market. I'll tell you what. For the money it's great because my three old tom's love it. I usually give it to them as a treat every few day. I hear lot's of people complaining about the brand but I've never had a problem. I have three male cats. The oldest is turning 21 this year. The next is thirteen and the youngest nine. 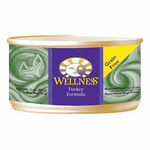 All have eaten this on and off their whole lives and they are healthy and happy and love this product. Quality of Ingredients I have to assume there is a good amount of tuna in there. It is a very smelly fishy scent which for some reason what the cats like. I have not looked very closely at the label but I'm sure it's every bit as good or comparable with the more well know brand names. I am positive that the ingredients in this product are in no way harmful to a cat. Flavor Selection This is a tuna fish flavor therefore that's all there is. There are other varieties of 9 lives like kitty stew which my guys like as well. For many years I fed a colony of feral cats (I trapped, spayed and neutered them, and returned them to the colony). I fed them a constant supply of dry food all day and gave them canned food for breakfast and dinner. I needed to find a food that was inexpensive yet provided a reasonable level of nutrition for them. 9 Lives Tuna Select was among the options I chose to feed them. They all seemed to like the tuna flavor and the larger, 5.5 ounce cans meant that I had to feed only a few cans at a time so everyone could have some. Yes, the nutrition isn't at the top of the range and it doesn't use premium ingredients, but when you're feeding about thirty cats daily you need to make some sacrifices. I simply could not afford to feed them a premium, artisan canned food from the pet store. Everyone who ate this was happy and healthy and no one experienced any tummy upsets. The tuna flavor was certainly a hit for them but be aware that it does stink to the high heavens! This is a very good buy. My cats are very particular, so I spoil them with good food. They know the difference between cheap and good cat foods and show me by looking up at me pathetically when they do not like the cheap stuff. This is inexpensive food which is an exception to this rule. It's good quality and they all consistently eat it and leave none in the dish. It also has a texture which is just the way that they like it, with just enough moisture, with tuna flakes that they like a lot. I feed a total of 14 hungry cats, and they all eat this happily. My stray cats paw the door to tell me that they want more. Quality of Ingredients Pretty good. I judge this by the reaction of my cats, who delve right in when I feed this to them, rather than sniffing to decide whether it's good first. This food is consistently a hit with them all. Flavor Selection Nine Lives offers several choices that my cats like. This variety plus the salmon are their favorites. Do not buy this food for your cat! I did a review recently about 9 Lives dry food and how it made my cat very sick. At the time I was feeding her the dry food, I was also giving her the wet food occasionally. It was a huge mistake to buy any food made by 9 Lives for my cat. She started to get sick right from the start. First, she threw up just after I gave it to her. Soon, she was throwing up all the time, several times a day. I did not realize it was the food. She lost weight and I took her to the vet because I was so scared. The vet told me that her stomach was extremely sensitive and that the food I was feeding her was terrible. That it was seriously messing with her stomach. She told me the ingredients in 9 Lives were not good for cats. I, immediately, started feeding her another brand. After that, she stopped getting sick and perked up, which was a huge relief to me. I would not recommend this food for any cat. It is terrible. 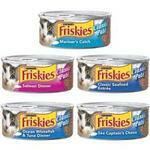 My cats love this food, but that being said I don't think it is the best choice out there for them. The smell is very strong and as to be expected with a fish cat food is very 'fishy', I think that may be the reason my cats are so drawn to it. The ingredants show a long list of vitamins and other benefits but no more than most canned cat food has, and on the negative there is a noticeable amount of oil in this food. While oil is good for a cat's coat it still seems like too much when you open the can and there is a thin layer of the stuff around the edges. I doubt it's harmful, but it does make me wonder about the fat content in the food and I wouldn't recommend it being fed to sensitive pets because it may be too heavy on their stomachs. One of my own cats has some health issues and he never seems to be able to finish out a can before he's done with it but my other cat without any health problems has no trouble eating one entirely by herself. So it's not the very best food out there but it's an okay choice if you're looking for something in the lower end of the price range as a supplement to add in with also feeding your cat dry food to cut down some of the fat. Quality of Ingredients You can tell it's a somewhat lower end product, the cats love the taste but that may be due to the excess of oil in the food. Flavor Selection Has a basic selection of flavors and is pretty standard in that regard, doesn't stand out too much.